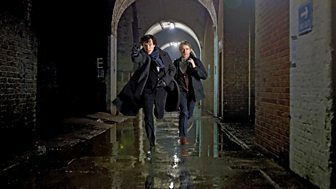 Dr John Watson returns from service in Afghanistan and finds himself drawn inexorably into the world of the brilliant but baffling 'consulting detective', Sherlock Holmes. Test your own powers of deduction and help Sherlock decipher hidden messages from Series 1. Mark Gatiss investigates Sherlock’s school of thought. Get the latest Sherlock news and discover more shows with the BBC’s newsletter.